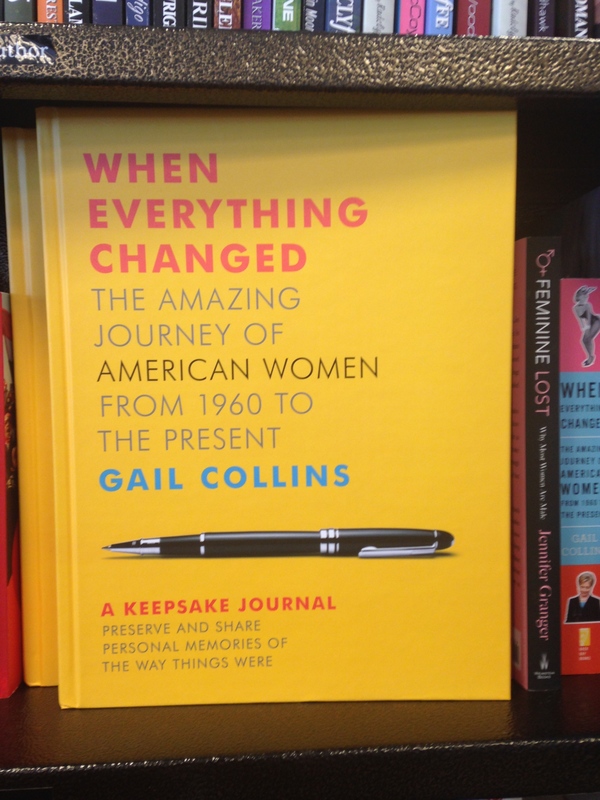 Spotted in a Barnes & Noble women’s studies section: This new “keepsake journal” version of Gail Collins’ 2010 history of “American Women from 1960 to the Present.” This book also comes in a totally regular paperback edition (see below), but you’ll notice something is missing from the original version: a way to make the reader feel involved by contributing her (presumably her) own thoughts and experiences. The new version nicely synthesizes trends in journaling and scrapbooking with reading. Really, this book is now a sort of DIY coffee table history. Why was this necessary? Do readers need to be guided to “preserve memories of the way things were?” Perhaps so; certainly, the “reading group guides” in the back of so many popular novels nowadays suggest that publishers believe readers need much guidance, indeed. Here, again (not unlike in the WFM example, below), a particular irony emerges: this book is implicitly and sometimes explicitly a feminist history of a period when women made great advances, some of which centered on questioning dominant societal institutions. This keepsake version plays right into the dominant institutions of marketing and consumerism while reiterating the image of women as keepsake-makers. It’d be interesting to know the rationale behind this edition. Certainly, this “ Keepsake Edition of the national bestseller, now with space to preserve and share personal memories of the way things were” (Amazon) retails for more ($20 as opposed to $16 for the paperback or 9.99 for the kindle), but it’s safe to assume that generating a wider audience was equally important. I wonder if in other stores they group this with journals or scrapbooks. Related to that, it would be interesting to see if on Barnes and Noble online, Amazon, et al. if this book would come up in a search for journals and scrapbooks in addition to a search for women’s studies titles, reflecting what you pointed out about the publisher’s desire to connect this product with a wider group of consumers. So ironic to see how products and even whole stores (as in your WFM post) are making it possible to consume social movements (and ones that embraced an anti-capitalist, anti-mainstream consumer culture outlook).